Users of FileMaker Pro may want to consider updating the database management system for Windows, Mac, and the web to the recently released and latest version, FileMaker Pro 11. For along time, especially among Mac users, FileMaker Pro has been the go-to Software suite for all of your database management needs and with this latest release seems to be stepping on their offering once again with a ton of great new features and overall performance improvements. Now your data can take on a whole new dimension with FileMaker Charts in FileMaker Pro 11. Create eye-catching reports in five different styles including vertical bar, horizontal bar, area, line and pie charts. Plus, make high-impact web dashboards by publishing your charts to the web using Instant Web Publishing. 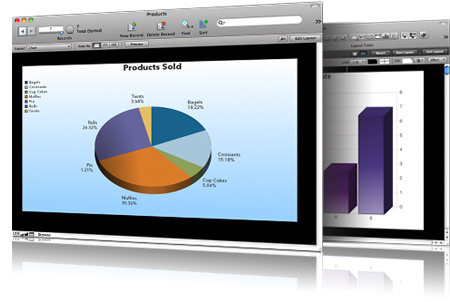 With FileMaker Charts, you’ll share and analyze your information like never before. 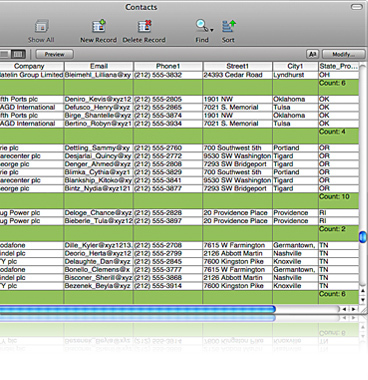 Make reports in a spreadsheet-like fashion and get even more out of your data. Group and summarize your information on the fly directly in Table View to create professional looking reports. Easily modify your reports by adding, sorting, or hiding fields and records. 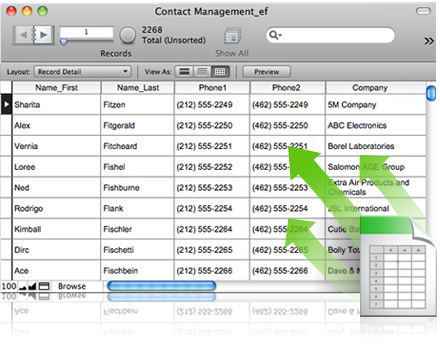 Create reports in FileMaker Pro even if you’ve never used a database before. It’s even easier to create customized reports in FileMaker Pro using the enhanced Layout/Report Assistant. A new streamlined interface guides you step-by-step in building reports with grouped data. Select styles and themes. Add headers, footers, subtotals, or scripts. Create polished reports in minutes with the improved Layout/Report Assistant. Sometimes you need a report where a set of records stays the same but the details change. Let’s say you want to track the results of sales leads received yesterday. Create a Snapshot Link file to save a specific set of records at a point in time. This also preserves the same layout, view, and sort order. Any changes you make to the file will be updated in the database. 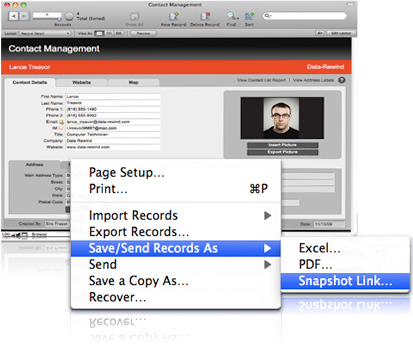 Plus email the Snapshot Link to anyone who has FileMaker Pro 11 for easy collaboration. In FileMaker Pro 11 you can establish a Recurring Import from Microsoft Excel, CSV or TAB files. Set it up once, and every time you open your database, the data from your Excel spreadsheet or data file will update automatically in FileMaker Pro. Imported data is read-only. Use this data to easily create sales reports, track workflow, and collaborate with others.